At 11:28 a.m. on December 11, at Tamagusuku in Nanjo, human bones which appear to have been buried in Sakitari Cave were found. A finger points to a head with arms on the right and left, and a pelvis at the bottom. The bones were found with the head and upper body connected together. According to an official of the museum, the bones were possibly put into the land as burial. 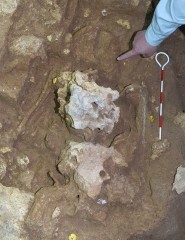 He said, “This indicates the possibility that people at that time used to use caves as graves.” In Okinawa, this is the first and oldest specimen of a connected skeleton found in its original position and not relocated. Bones from one adult individual were discovered, with mainly upper-body parts such as the skull and arms, as well as the femur and pelvis. The bones were dug from about three meters beneath an excavation site near the entrance of Sakitari Cave. The bones were found in a posture lying flat and facing up, covered by four pieces of limestone about 30 centimeters in diameter, which suggests this was a deliberate burial. While prehistoric human bones from the Paleolithic era, about 20,000 years ago, like the Minatogawa Man and the Shiraho Saonetabaru Cavemen, have previously been discovered in Okinawa, this is the first time a specimen with a connected skeleton has been found.